Can't get enough of the smooth mix! Energy booster! Just rides. Unfortunately i have to admit that this remasters sound pretty bad to my ear. Is it just me, or is this a bad pressing? 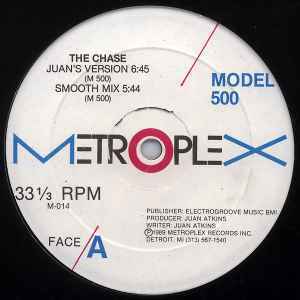 Damn good record, Juan's mix is something that needs your turntables attention. Wicked techno track by the Techno Godfather Mr Atkins. The remix names on this U.S version are different than the U.K release version but dont be fooled. The mixes on both presses are both the same. Just named different. Better mixed than the Metroplex 12", cleaner sound. And of course, the iconic "running man" on the sleeve made by the "Kool Kat crew", makes this item a better choice. Mr Atkins blends both organic/electro in this classic tune from 1989. You can hear the typical early machine-coded Model 500 basslines together with more Derrick May influed organic structures. Check out the Mayday remix!